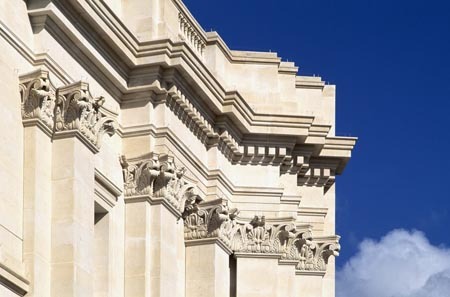 Sainsbury Wing at the National Gallery, in London, United Kingdom, wins the American Institute of Architect’s (AIA’s) 2019 Twenty-five Year Award. The American Institute of Architects (AIA) has recognized the Sainsbury Wing of the National Gallery in London, designed by Venturi, Scott Brown and Associates (VSBA), with its Twenty-five Year Award. The award is conferred on a building that has set a precedent for the last 25 to 35 years and continues to set standards of excellence for its architectural design and significance. Spanning 11,148 m2 (120,000 sf), Sainsbury Wing is one of the world’s most visited collections of early Italian and Northern Renaissance paintings. Its original design is still largely intact and has had few alterations since its completion. In 2018, Historic England, the government arm charged with protecting England’s historic treasures, bestowed Grade I status on the wing, making it one of the country’s most architecturally significant buildings. Robert Venturi, FAIA, and Denise Scott Brown, FAIA, VSBA’s founding principals, sought to relate the new wing to the gallery while maintaining the wing’s own identity as a work of modern architecture. A play on Italian Mannerism, the Sainsbury Wing demonstrates the architects’ acknowledgement of modern conditions, while exploring classical architectural conventions.